At a glance, what AraabMuzik does seems simple. 16 buttons to construct a beat is only a hop, skip and a jump from banging out beats with your bare hands on a table, right? Everyone’s done some form of that. But once you see AraabMuzik in action, the words “simple” evaporate from your vocabulary. He’s used his MPC to create everything from classic Dipset beats to massive EDM house bangers. The machine isn’t everything though; AraabMuzik holds originality, versatility and innovation as his core musical principles, driving his sound through many iterations. 16 beatpads is more than enough to make sonic masterworks for the self-proclaimed “MVP of the MPC.” He’s ridden his MPC from his parent’s bedroom in Providence, Rhode Island to performances at the world’s biggest festivals and The Late Show with David Letterman alongside A$AP Rocky, A-Trak and DJ Clark Kent. That machine is his livelihood, his artistic inspiration, his right hand. He even takes the damn thing to business meetings. Rapping and singing were never in the cards for young Abraham. Early on, he gravitated towards producers and instrumental makers; Pete Rock, Swizz Beatz, DJ Premier and J Dilla are just a few of the beatmakers he idolized and modeled himself after. He established his name years before he touched his first MPC. “I couldn’t think of anything, and then one day, my man called me ‘Young Arab’ and I just ran with it,” AraabMuzik reminisces, “I just stuck with it and from there I added ‘musik.’” He later would add an additional ‘a’ to ‘Arab’ because he isn’t Middle Eastern and didn’t want to give the wrong impression. While he had some early production under his belt using a midi keyboard and the computer program Drum Station, it wasn’t until he was 15 and received his first MPC – the MPC 1000 – that he found his sound. “Started banging on those pads and I’ve been doing it ever since,” he explained in a 2011 interview. The story of how the producer got his drop (“You are now listening to AraabMuzik”) is a microcosm of how he makes his music, even if it happened by accident. In a move that was likely a subtle flex, the person who recorded the drop was “a high school crush,” by his own admission. He had her on speakerphone, and recorded her saying the drop using a video camera his family owned. The resulting tinny breathlessness is a result of the haphazard recording process, he says. Just like recording drums live, the drop was recorded in one take. In all things, AraabMuzik prefers potentially imperfect originality to manicured perfection. Luckily, there was an online video platform called YouTube that became quite popular as he progressed through high school. He began uploading his footage of him making music on his MPC and soon enough someone came calling. That person was DukeDaGod, Dipset A&R and exactly the connected person AraabMuzik lacked in Rhode Island. He got his first production credit on the intro track to More Than Music 2. Soon enough, he was producing a few records for Hell Rell while still in high school, but after he graduated his workload turned up to match his newfound free time. That work ethic didn’t come easily, as is often true for recent high school graduates. At one point Cam’ron had to sit young AraabMuzik down and tell him: you gotta get the work done, then you can chill. And AraabMuzik did exactly that, cranking out nine beats in a single afternoon. The hard work paid off – his first (relatively) big hit came in 2009 on Cam’ron’s street classic Crime Pays: “Get It In Ohio.” Things only got better after that. AraabMuzik’s MPC of choice has been the Akai 2500 for some time now (he’s sponsored by Akai). Aside from the central MPC, he uses “a laptop with a midi keyboard and a couple programming softwares, VSTs for additional sounds, melodies and stuff like that.” He programs everything himself, only using the software to collect sounds for use in his MPC. When asked which software he favors for those sounds, he's agnostic, not preferring one over another. A musical collector, he's amassed an impressive array of samples, live instrumentation, and pre-packaged kits throughout his 10-year career. His advice to aspiring producers? “You gotta just sit there and browse through a lot of sounds." The live drumming is what gave AraabMuzik his popularity and makes him such a pleasure to watch perform, but as a result his back-end preparation work often gets buried. “It’s very time-consuming,” he says, something that’s at odds with the almost magical alacrity he can create a mind-blowing beat. While AraabMuzik has claimed he can produce “anywhere” as long as he has his equipment, he still has his preferences. For one, he likes to produce in with dim lights, “cool-like.” He also produces completely sober, unlike the vast majority of hip hop producers today. 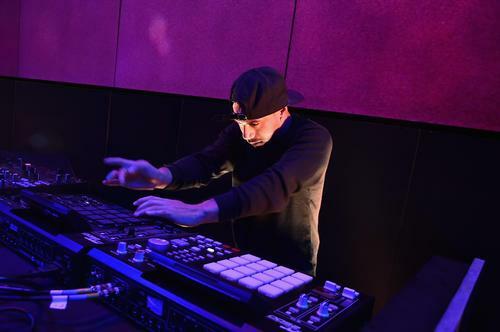 That may be a facet of his particular style; recording live – especially at AraabMuzik’s speed – requires significantly more hand-eye coordination than arranging and tracking a beat at one’s leisure in FL Studio or Ableton. That’s not to say he’s straight edge; he simply prefers to smoke and drink when he’s not working. His preferred production environment seems suited to the dreamy, electronic style that popularized AraabMuzik as a stand-alone performer (along with his live show) and gained him the cross-over appeal to perform at colleges and festivals around the nation. Originality often falls by the wayside in production when everyone is chasing the popular sound of the moment, whether it’s DJ Mustard’s funky bass hits, 808 Mafia’s huge drums, or Sonny Digital’s snapping snares. AraabMuzik takes an alternative approach, shunning the popular sounds on the radio (he once said of the radio: “Everything sounds the same”) and going out of his way to alter any stock sounds he uses. “I don’t like using a sound how it is, because people can so easily be like, ‘oh, he got that from that [VST],” AraabMuzik states. “I always like to make things unique and my own.” Remember how he recorded his drop? Take that approach and apply it to every sound he puts into his MPC, whether he’s distorting the original digitally or re-creating it himself. His live set-up looks much like his studio set-up, two MPCs side by side so he can quickly transition or enhance a build. His impressive live show and crossover tracks like “Salute” brought him to the EDM world, which leans more heavily on concerts and festival than hip hop. Asked which songs are his go-to for live performances, he refuses to be pinned down. “I don’t really play the same stuff over and over. I always create new sets every other week or so,” he explains. He’s not shy about what sets him apart from 99% of other DJs, either. “Studio artists [will be] on stage with a laptop playing a tracklist,” AraabMuzik says, echoing a common criticism of EDM concerts. “That’s versus me, where I am on stage with my equipment, doing everything on the spot. And not just for 20 minutes. For an hour and a half straight.” He doesn’t get tired anymore, although he says he used to at one point. His recording process is so similar to his live show that he’s essentially practicing for his live show when he’s in the studio, a phenomenon usually reserved for traditional, instrument-based music. Experimentation and growth are central tenets to AraabMuzik’s approach to music, so he embraced the interest of the EDM world. You’ll hear this on Dream World, on tracks like “Stadium House,” which wouldn’t sound out of place on a Boys Noize or Sander Van Doorn album. However, his growth in electronic music starts and stops at the music. “I’m not just standing there with a whole bunch of lights, my hands in the air. Screaming on the mic all night long,” he explains of his onstage persona. “I think that’s something people appreciate seeing in an artist.” He takes this stance to the furthest degree, often uttering only a few words throughout a set. When I saw him perform in 2014, the only words he spoke were a greeting and a simple “thank you” when he finished his set. He’s admitted he might have a hype-man problem, but his music is compelling enough that he doesn’t need one. As for what’s next for AraabMuzik? You’ve probably seen his name in the headlines recently in conjunction with Joe Budden, as he produced both diss tracks the Slaughterhouse rapper dropped taking shots at Drake. As a new generation of EDM fans begins to morph the genre, AraabMuzik says his next move will take him back to his roots. “I don’t come from EDM, so I wanna go back to the hip hop vibe of things,” the producer affirms. “But also just keep those EDM samples and things like that with the hip-hop drums, hip-hop style and everything like that.” It’s all about growth and evolution for AraabMuzik, and at the top of his game at 27, he’s capable of creating the aural world of his dreams.